I came up with a plan to try for a day, but my wife pointed out that I wasn’t really challenging myself, and that I should try to do it for two weeks. So I did. The bus route closet to where I live used to come within two blocks of my house. (My wife, who works downtown, actually took it to work for several days after Hurricane Katrina.) However, the budget cuts of the Great Recession caused the route to be shortened. My route now turns around at a shopping center over a mile closer to town. So, I cheated a little. I drove to that shopping center and parked among the cars of employees early every morning. Next came a 15–20 ride to the downtown community college campus. Once I got off there, I had the equivalent of about six city blocks to walk. All in all, I left about an hour earlier than I had been, and got to work about 45 minutes earlier than I normally do. This allowed me to leave a little before 5 each day, in order to catch an bus which would get me back to my car in time to drive to two different schools to pick up my kids. I really enjoyed being able to do what I wanted instead of worrying about traffic. I have been listening to audiobooks and podcasts for years, but now I could read or watch videos as well, if I want to. The length of my bus ride was, if anything, a little too short. I would just be getting into the book I was reading, or be in the middle of a step-by-step video, when it was time to get off. I even missed my stop one morning and had to walk back several blocks from the next one. 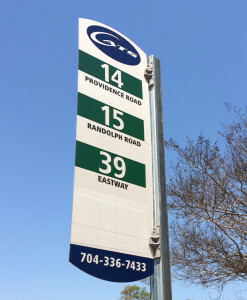 The Charlotte transit system (CATS) is not set up to encourage commuters. There are weekly and monthly passes available, but they run by the calendar week or calendar month, and they cost the same as paying for two trips a day. They save you the trouble of carrying exact change, but if you have to drive one day, as I did, they end up costing you more money. The only discounted pass is the 10-ride pass, which is good until you use it up, and saves you 15%. Buying a pass is a pain. CATS said that I could get passes at any of the three big grocery store chains in town, but none of the stores near me sold anything but the monthly pass, if they sold any at all. I had to go the Transportation Center downtown to get a 10-ride pass. The bus that I took, at the times that I took it, was never more than half full. I never wanted for a seat, but it made me wonder what it would take to make the system fully utilized. In the end, I can summarize my experience this way. I will continue to take the bus as often as I can. It’s worth it to me to avoid the traffic stress and have more time to catch up on whatever I want to do. The extra exercise doesn’t hurt, either. What if enough commuters decided to take the plunge with me and fill the bus? If enough buses got full enough, the traffic congestion for those who drove, out of necessity or choice, would probably get noticeably better. That’s not going to happen unless CATS makes it easier and cheaper for commuters to get passes. My commute on the bus was about 4 miles, and if you use government mileage allowance as rough estimate of what it costs to drive, I came out cheaper riding the bus. It was still a hassle, and I was motivated by a personal challenge. For the average person, I’m not sure there the WIIFM (What’s In It For Me) factor is high enough. Finally, I’m not sure what all the shopping centers in town would do if a third of their lots were suddenly became de facto park-and-ride lots. I do actually patronize many of the stores in that shopping center where I park, but I’m like the person who doesn’t get vaccinated but doesn’t get sick because everyone else did get vaccinated and so a disease becomes rare. (“Herd immunity” for mass-transit, so to speak.) If enough people did it, it would spoil it for everybody.